It is said that friends are the family you choose, and in Saint Anything, Sarah Dessen gives us a great juxtaposition of the family you choose versus the family you're born into and how they can change your life. Sydney has been overshadowed her whole life by her older brother Peyton, whose larger-than-life personality got him into increasingly more trouble until he hits a guy on a bike while driving drunk one night and lands himself in jail for a year and a half. Sydney feels more invisible than ever, with their mother becoming overly invested in babying Peyton and their father going along with whatever she says, ignoring her protests to be looked after by Peyton's creepy friend Ames. So when she transfers to a new school and meets Layla and Mac Chatham, whose family is loud and loving and owns a pizza parlor and likes bluegrass music, things start to change for her, especially when she and Mac start developing feelings for each other. 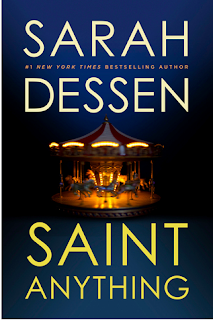 Sarah Dessen is famous for writing realistic YAF romance, but what I really liked about Saint Anything is that it's not about the romance at all, and it's not merely Mac who helps Sydney find her voice, but all of her friends. It's a group effort, you guys! I've read enough books where the boyfriend ends up becoming the savior, and sometimes that's nice and all, but other times you want to see a relationship where it isn't an isolated us-against-the-world scenario. Layla, who ends up becoming Sydney's best friend at her new high school, is a force of nature - I liked her immediately, and I liked how supportive she is even when she doesn't even know Sydney very well yet. She's strong-willed, outspoken, and unabashed in her love of French fries. Until Sydney comes along, she's the only girl in her friend group (which consists of Mac and two other guys), and she's no shrinking violet. One moment that had me absolutely fist-pumping is when Sydney invites Layla to sleep over in a panic, because her parents are out of town and have left Ames in charge of her, and his idea of being in charge of her is cooking a candlelight pasta dinner that she absolutely does not want. Not only does Layla shamelessly weasel her way into being invited by Sydney's mother to stay the rest of the weekend, but she also sets up her air mattress and bedding right in front of Sydney's door (which has no lock), in case of any unwanted intrusions. Now THAT is a hero. I also enjoyed the juxtaposition of Sydney's mother and Mrs. Chatham, Layla and Mac's mother. Sydney's mother focuses all her energy on doing whatever she can to make Peyton's jail time as comfortable as possible, and she apparently refuses to shoulder or even acknowledge any guilt about the boy whom Peyton hit with his car. ("What's a fifteen year old doing riding his bike at that time of night? ", she actually says.) Her level of involvement is obsessive, and as it becomes clear that Peyton doesn't want her to baby him or make excuses for him, she starts feeling more frantically helpless and useless. Contrast that to Mrs. Chatham, who is wheelchair bound due to MS. It is clear that while her illness limits her physically, she absolutely has the sort of rock-solid relationship with her kids that Sydney's mom does not seem to have, and it becomes even more apparent when we see how much care Mrs. Chatham takes with Sydney as well. Sydney's parents have physical ability, money, and access to resources, but the Chathams are the ones who really see Sydney and are able to offer her the emotional support that she so clearly needs. Mac is an interesting foil to Sydney in that they both understand about being invisible as well as being visible for the wrong reasons. Sydney lives in the shadow of her brother's volatile and troubled reputation, while Mac lives in the shadow of his former self, as a former fat person. It's made very clear that Mac is absolutely gorgeous now that he's lost weight and developed a fit and healthy lifestyle, but it's not like everything has become sunshine and roses for him - he still has issues about his body, and he's uncomfortable with the overt female attention he receives, and I think that's very honest, since losing weight doesn't just make all your old feelings disappear. Ames is creepy AF. That's all I have to say about him. His behavior is borderline triggery, and I would like to offer a warning that there's some majorly creepy attempts at manipulation as well as an assault attempt in the climactic moments of the book. I felt sick to my stomach every time he was mentioned. It's a pretty good book. 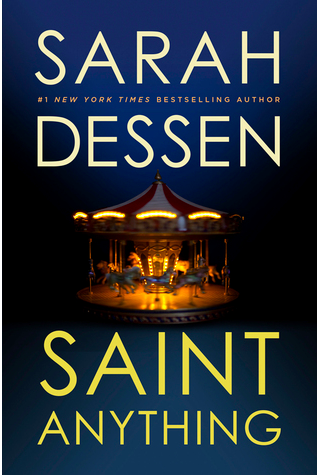 I haven't read enough of Sarah Dessen's other books to compare (and the ones I did read, I read a long time ago), but I like character-driven stories and that's what this one is. You get to explore not just how Sydney changes but also how her family dynamics change. Compared to some of the other books I've read recently, which are fantasy novels that featured brave, I'll-go-down-fighting female protagonists, Sydney is quietly dealing with her own feelings as a consequence of her brother's behavior, and part of her growth comes from finding an alternate support structure, rather than trying to survive it all on her own. (Though, she does get to hit a dude. And that was pretty satisfying.) After being Peyton's sister for so long, Sydney finds a way to be Sydney, and to show who she is to the most important people of all - her parents.